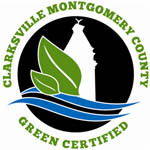 First Choice Moving & Storage has met all of the requirements for Clarksville-Montgomery County Green Certification and recertified September 2016! In addition to participating in the workshops and providing all of the necessary paperwork, including an Environmental Management Plan, First Choice Moving and Storage has shared data in the areas of recycling, energy efficiency, reuse and repurposing, pollution reduction and stakeholder communication over a six-month period as well as provided some of your long-term goals. After discussing the changes in today’s society, we decided to get involved and start protecting our community and the world we live in. In 80% of our customer’s homes we noticed that recycling was a part of their everyday life. Cardboard has always been recycled at our location, however, we now recycle paper, plastics, and aluminum. We will even haul off our clients wastes after our services have been provided. We use blanket pads for all in town moves and use recycled paper pads for all storage and out of state jobs. In the office we have begun conserving water and energy, and are using Ameo Essential Oils to clean the office! We are always looking to improve in the “Green” area. Additionally, First Choice has became a distributor for Ameo Essential Oils. In making this decision, we wanted to give access to our clients to use these oils in their own homes. Ameo offers dozens of products extracted from nature's most giving botanicals. They are processed through Certi-5 validation, which guarantees quality, purity, and usability. What are essential oils? Ameo oils are a naturally – produced liquid obtained from the roots, flowers, fruit, bark, stems, and other elements of a botanical. One can benefit from these oils with extensive therapeutic and medicinal properties. There are several ways to use these oils, aromatically, topically, and internally. In our office we are using them aromatically. These oils are diffused into the air to provide a welcoming aroma, as well as provide our employees therapeutic benefits. We are using an all purpose cleaning mixture to clean and disinfect. The solution contains 1 cup of water, ½ cup of distilled vinegar, and 10 drops of lemon oil. We also have a mixture to keep pests away! Visit our Ameo website if you'd like to get more information on Ameo essential oils. You can also follow us on Facebook to catch wind of our uses for these oils. Jessica, our office manager is always willing to discuss our “Green” program and Ameo oils. She can be reached in the office at 931-920-5455. We place a high value on client satisfaction, and our professional staff tailors each relocation package to best suit our client’s needs. Our “Green” certified moving teams will treat your belongings with the utmost care. With decades of experience and accumulated know-how in the transition industry, we will make your transition seamless and stress-free. What is 68 plus two?